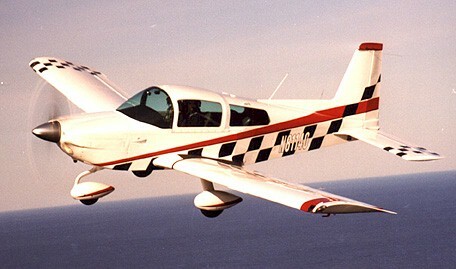 The Grumman-Gang are airplane owners, pilots and others who fly or wished they flew the so called "Grumman" light aircraft and who keep in touch by e-mail, exchanging information about maintenance, where to get parts, etc, and to remind people about fly-ins where cyber pals can press the flesh. People come and go but there are usually about 1000 active folks at any time. They have been brought together by Mark Matthews of Hillsboro OR, who originated the Grumman-Gang and who pays for and operates the mailing list that distributes mail among Grumman-Gang subscribers. To the left is Gord Lemon over the Chugah Mountains near Anchorage. Anyone who would like to join the mailing list can fill out this request form. This will add you to the mailing list, which will deliver about 20 - 30 messages per day to your mailbox. If this proves too much for you, you can use the same form to switch to the digest version of the list which takes those 20 - 30 messages and bundles them into one message which is delivered roughly once a day. The same request form can also be used to unsubscribe from the list. Bottom Row: Bob Gibson, Stu Morse, Neita Blondeau, Roger Hale, Ian Matterface, Ron Rosenberg. The opinions expressed by the Gang subscribers are their own and anyone acting on such opinions or advice is doing so at his or her own risk. The use of the maillist is regulated by a set of 'rules'; please review them. On the right is Edna Young and Allan Ontko's Tiger. On the left is Greg Amy's. Seen here in fresh paint off the coast of New Hampshire, it's so fast that it required the photo skill of Walt Porter and the throttle management technique of photo ship pilot Stu Morse to capture it on film. The Grumman-Gang is made possible by Mark Matthews, who is the Webmaster and provides and maintains the mailing list.